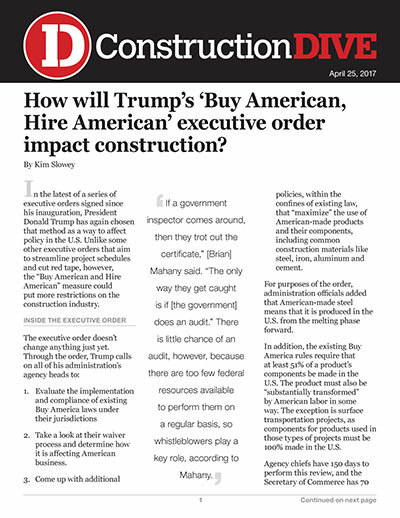 How will Trump's 'Buy American, Hire American' executive order impact construction? In the latest of a series of executive orders signed since his inauguration, President Donald Trump has again chosen that method as a way to affect policy in the U.S. Unlike some other executive orders that aim to streamline project schedules and cut red tape, however, the "Buy American and Hire American" measure could put more restrictions on the construction industry. Take a look at their waiver process and determine how it is affecting American business. Come up with additional policies, within the confines of existing law, that "maximize" the use of American-made products and their components, including common construction materials like steel, iron, aluminum and cement. For purposes of the order, administration officials added that American-made steel means that it is produced in the U.S. from the melting phase forward. In addition, the existing Buy America rules require that at least 51% of a product's components be made in the U.S. The product must also be "substantially transformed" by American labor in some way. The exception is surface transportation projects, as components for products used in those types of projects must be 100% made in the U.S.
Agency chiefs have 150 days to perform this review, and the Secretary of Commerce has 70 days after that point to submit a report to the president with recommendations. The order also directs various federal agencies to review the current H-1B program and decide if anything needs to be tweaked in favor of American workers. So how could this latest executive order impact the construction industry? "What they’re looking at is evaluating the laws that they have," said Steve Cvitanovic, co-chairman of the construction law practice group at Haight Brown & Bonesteel. "They can’t change the laws, but they can change how they’re enforced." One thing is for certain: The rule creates a great deal of uncertainty for the industry. "There are so many wheels in motion and moving parts that we don’t know exactly what [the potential policies] are and the chances of them being enacted," said Peter Muoio, chief economist and executive vice president of commercial real estate firm Ten-X. In addition, he said, this executive order adds to the collection of Trump policies that seem to have the potential to work against each other. "Some of these policies meant to raise the economy could raise costs," Muoio said. For example, Muoio said, immigration reform could increase the cost of construction if vital workers are deported and other workers aren't able to come in. This could negatively impact Trump’s $1 trillion infrastructure plan, as could shortages or higher costs resulting from the Buy American side of this latest order. Then there’s the inevitable pushback from construction industry players if this order results in increased buying restrictions. Scott Berry, director of the Associated General Contractors of America's utility infrastructure division, told Construction Dive last year that politically charged phrases like "Buy America" may sound good, but they don’t always take into consideration today’s global economy. In addition, he said, if the U.S. tightens controls on the entry of foreign goods, then other countries could do the same with items manufactured in the U.S. However, there are also construction companies that don’t concern themselves too much with the international market for construction materials and look at more restrictive sourcing of materials as a way to positively impact the U.S. economy. "Much of the stuff we build we don’t design, so if we have a client that hires an outside architect who specifies … stone from Italy, we don’t have any other choices," said Richard Markel, vice president of design and construction for UA Builders Group. However, he said, when UA controls the material selection, it uses local suppliers. Many of its clients insist on an environmentally friendly building process and want to create as little trucking-driven greenhouse gas emissions as possible. In addition, Markel said, relying too heavily on cheaper, foreign-made goods "devastates our economies." He said he’s not sure the answer lies with this latest executive order but added that he believes America should reconsider how it conducts trade with global partners so that "we don’t cut ourselves out of business." One unintended consequence of a stricter Buy America policy, however, could be an increase in fraud, according to attorney Brian Mahany, who specializes in whistleblower law. Mahany said he has represented the government’s interests in cases against companies that violate the country’s Buy American laws by attempting to pass of off foreign-made goods as domestic. For example, fraudsters often buy samples from a U.S. steel mill and save the accompanying documentation to use as proof that foreign steel was manufactured in the U.S.
"If a government inspector comes around, then they trout out the certificate," Mahany said. "The only way they get caught is if [the government] does an audit." There is little chance of an audit, however, because there are too few federal resources available to perform them on a regular basis, so whistleblowers play a key role, according to Mahany. Even though stricter Buy America rules can be a boon for manufacturers, Mahany said, they can make attempts to pass off foreign material as American-made even more tempting because the higher the prices, the more money those operating illegally can bill federal agencies while still paying for the cheaper material. "Owners are going to have to start testing steel," said Andrew Richards, chairperson of the construction group at Kaufman Dolowich & Voluck. "If they don’t do that, people are going to keep doing what they’re doing." For the industry in general, Richards said that tightening up sourcing rules would only create production delays and skyrocketing material prices. "I think it’s going to hinder projects," he said. "You’ve got to get these mills in America producing a lot more steel." As far as the "Hire American" component of the executive order, experts maintain that because the construction industry isn’t a big user of the technical and specialty-focused H-1B visas, that portion of the order won’t have much impact. Even a company as big as Turner Construction utilized only a handful of these visas last year, and they were mostly for workers in some kind of engineering capacity. However, Cvitanovic noted that the order could allow for broader changes to more than just H-1B visas. "Under the Hire American provision of the law," he said, "it states that in order to create higher wages and protect the economic interests of workers, [the administration can] enforce and administer laws governing workers from abroad." This could impact those in the construction industry who are authorized to live and be employed in the U.S. under various forms of work visas, including those who have secured asylum in this country. While the "Hire American" portion of the order wouldn't likely affect residency status for those individuals, it could keep them from getting a job. "If they decide to enforce those laws more vigorously," Cvitanovic said, "then you could have a worsening of the labor shortage in the construction industry."